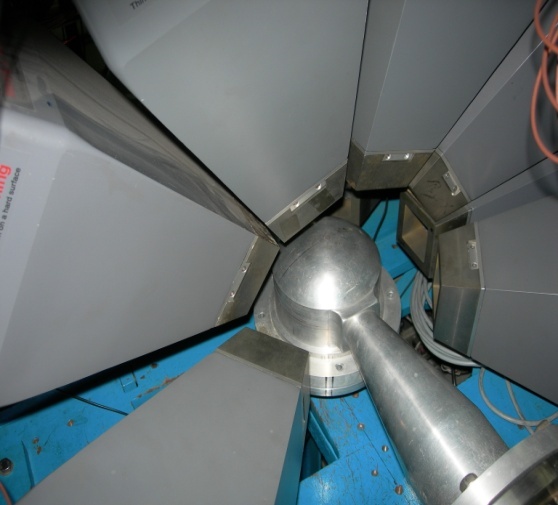 Indian National Gamma Array (INGA) is an array of state of art new generation Compton suppressed Clover HPGe detectors, which is a collaborative national project in India for nuclear structure studies using high resolution gamma ray spectroscopy. Variable Energy Cyclotron Centre has taken one of the leading roles in implementing this project among three accelerator centres in India. INGA project is collaboration among the national institutes, viz., Variable Energy Cyclotron Centre (VECC), Kolkata, Tata Institute if Fundamental Research (TIFR), Mumbai, Inter University Accelerator Centre (IUAC), New Delhi, Saha Institute of Nuclear Physics (SINP), Kolkata, UGC-DAE-CSR, Kolkata Centre and other universities. Photo:The photograph of INGA setup during VECC campaign. 10 Compton suppressed Clover detectors were mounted in the 3rd beam line of K 130 Cyclotron. 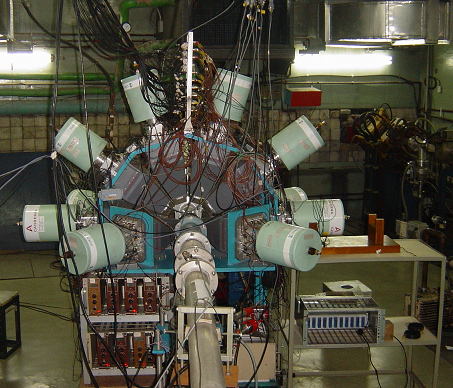 At VECC, Kolkata, the first campaign of INGA took place in 2005 with 10 Compton suppressed Clover HPGe detectors, to explore the physics possibilities with beams of heavy ions of higher energy (~7-8 MeV/n). The energy regime of the beams from ECR ion source was unique which allowed population of nuclei at higher angular momentum using non-equilibrated reaction mechanisms. In this campaign, in addition to the Clover detectors, 2 segmented Planer HPGe detectors, called Low Energy Photon Spectrometer (LEPS), were also added to the INGA setup for tagging of X-rays and to maximize the efficiency of detection of low energy gamma rays below 100 keV. The pictures of this setup at the beamline of K-130 cyclotron is shown in the figure.